Over the years, assisted living facilities have received an increasing number of requests from seniors for meals prescribed by their physicians and nutritionists. Meal planning is one of the most sensitive areas to coordinate in residential care homes. For residents, quality food takes priority over most amenities. Many seniors will refuse to stay at a residence if meals do not measure up to their expectations. In senior housing, meal planning is designing and organizing a variety of ingredients that is used as a guideline for controlling the types of foods residents consume at a budgeted cost. Meal planning is an important role in managing an assisted living facility. Nutritious food is the older person’s defence against chronic diseases and decline in health. Care must be taken to plan meals that are not only appealing but are also health promoting for the individual, especially for conditions like diabetes and other diseases directly affected by food intake. In residential care communities, special attention is given to foods that are generally well received by senior residents. Each resident naturally prefers certain types of foods over another, while some are eager to know if food substitutions can be made. Breakfast: assorted juices, fruit salads, hot or cold cereals, fresh eggs, breakfast ham/turkey slices, English muffins, hot tea, milk, or coffee. Lunch: tomato soup, mixed vegetable salad, fried chicken & green beans, fruit cobbler, hot and cold beverages. Dinner: grilled chicken or fish, mixed vegetables, pasta salad, cornbread muffin, hot and cold beverages. good, they will not be eaten. Residents who are not enjoying their meals are likely to look elsewhere to satisfy their nutritional needs. Ensure your facility generates nourishing foods that looks good and taste even better. Meal planning solutions is the act of identifying the type of foods generally offered to the older adult along with requests for therapeutic meals to determine what constitutes a balanced menu for the community that is also cost effective. Residential care owners can choose from a variety of financial tools to plan a Food & Beverage Budget. A formula commonly utilized by facilities is Per Person Daily to calculate the average costs for residents to dine per day. Meals are prepared based on regularly updated menus that cater to the nutritional needs of senior residents. Nourishing meals are often made from scratch with food purchased locally. A dedicated food service team is responsible for preparing at least three meals daily. Members of the team who are in charge of quality control include the dietary manager, kitchen supervisor, head cook, or administrative personnel. Review therapeutic diets against medical guidelines before serving meals. Prepare meals in accordance with sanitary regulations, established policies and procedures. Ensure safety regulations and precautions are followed by all personnel. Follow established Infection Control and Universal Precautions policies and procedures. 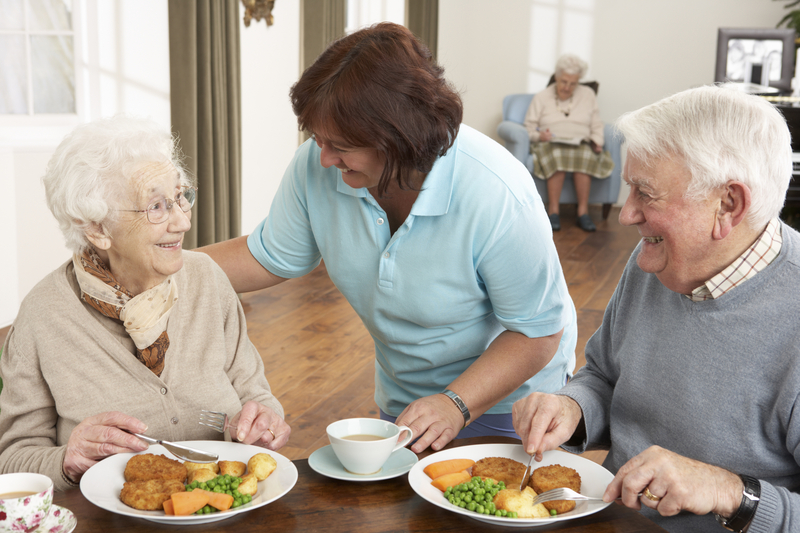 Food service programs have long been an area of emphasis for assisted living facilities. Recent surveys demonstrate this correlation between favorable dining programs and overall satisfaction from senior residents. One such survey done by the Agency for Healthcare Research and Quality shows that the dining experience for senior residents consistently influence their satisfaction and quality of life. Elderly residents value taste and quality foods on the menu, and they look for residential care communities to create memorable meals for health and daily comfort.